Located just 850 metres from the Montparnasse Train Station, Hôtel De La Paix is in central Paris, a few steps from the Jardin du Luxembourg. It offers free Wi-Fi. 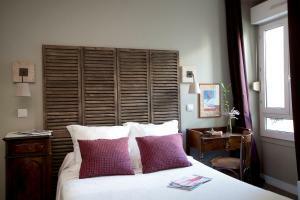 The guest rooms at La Paix are bright and air-conditioned. Each is soundproofed and equipped with a TV with cable channels, and a private bathroom. Guests can enjoy a drink in the lobby bar, and breakfast is served every morning in the 1930s-style breakfast room, or in the privacy of the guest rooms. Additional facilities include a lift and a 24-hour reception. Hôtel De La Paix is just 120 metres from the Raspail Metro Station. The famous Latin Quarter is just a 20-minute walk from the hotel, where guests can visit the Notre Dame Cathedral. This air-conditioned room features a flat-screen TV with cable channels, a telephone and a safety deposit box. The en suite bathroom includes a hairdryer. This room cannot accommodate an extra bed or baby cot. When booking more than 3 rooms, different policies and additional supplements may apply. This air-conditioned room features a flat-screen TV with cable channels, a telephone and a safety deposit box. The en suite bathroom includes a hairdryer. An extra bed or babycot is possible in this room, subject to availability. Rate: € 128.00 ... € 220.00; select dates below to get current rates. This air-conditioned suite features a flat-screen TV with cable channels, a telephone and a safety deposit box. The en suite bathroom includes a hairdryer. An extra bed or babycot is possible in this room, subject to availability. Rate: € 190.00 ... € 290.00; select dates below to get current rates. Rate: € 128.00 ... € 140.00; select dates below to get current rates. This air-conditioned room features a flat-screen TV with cable channels, a telephone and a safety deposit box. The en suite bathroom includes a hairdryer. A baby cot can be added to this room. Extra beds cannot be accommodated. Rate: € 138.00 ... € 240.00; select dates below to get current rates. This air-conditioned room features a flat-screen TV with cable channels, a telephone and a safety deposit box. The en suite bathroom includes a hairdryer. This room cannot accommodate an extra bed or baby cot. Rate: € 105.00 ... € 180.00; select dates below to get current rates. Rate: € 390.00; select dates below to get current rates.